A couple of years ago a fascinating book caught my attention. 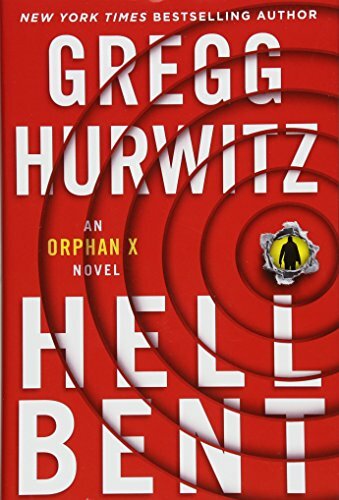 A thriller about a former government wet-ops agent who now worked secretly helping people who were in desperate situations, Orphan X was well written, had an interesting protagonist and strong secondary characters, and told a compelling story. Its sequel, The Nowhere Man, continued the story in riveting fashion, filling in backstory and introducing new characters to the series. The third in the series came out earlier this year, and it is a thriller reader’s dream come true. Hellbent is one of the most enjoyable books I have read this year. I finished it in a five-hour straight shot. I made the mistake of starting it after traveling all weekend, and could not put it down. From beginning to end, Gregg Hurwitz takes the reader on a ride that had me gripping the edge of the book with white knuckles. The first two books in this series were excellent, but this takes the series to a new level. Evan Smoak is Orphan X, part of a top secret program that recruited orphans who showed certain useful characteristics into a black ops training program. He was possibly the best of the “orphans,” brilliant, resourceful, and ruthless. His trainer, though, had become like a father to him, and as a father he taught Evan not only how to be a killer, but also how to be a human. Evan was raised with a code, commandments that his trainer instilled within him. “Do not kill innocents” was part of that code, a part that eventually led to Evan leaving the program and disappearing off the grid–which in his case was Los Angeles. When Evan’s arch-enemy Orphan Y, the new head of the Orphan program, finds Evan’s trainer and kills him, Evan has a new mission: kill Orphan Y. First, though, he must decipher his trainer’s final message to him. That message leads to a most unexpected package: a teenage girl who was also trying to escape from the Orphan program. Suddenly, the Nowhere Man has responsibilities that go beyond a mere mission. Orphan Y wants to kill her, too. How can Evan keep her alive, go after Orphan Y and his group of killers, and deal with the trauma and drama of a teenager? The result is a fast paced and action filled novel with twists and turns that go beyond the core “how does our hero survive and complete his mission” of all thrillers. It includes the shock and awe of a shopping trip to Target to purchase “female products.” It includes learning how to listen, how to open up, how to become vulnerable without losing his edge. It includes asking a mother for advice on talking to a young girl. And before you know it, you realize you’ve read a complete novel with the requisite body count of a high octane thriller, but with an unexpected and delightful emotional depth that is rare in this genre. Hellbent checks the boxes for a thriller. But what makes it next level is the emotional growth of the characters. We see new sides to some familiar characters. We see Evan needing help and reaching out for it, and we see others stepping up for him. We see a young girl, traumatized and alone, make informed choices that define who she is and who she will become. Throughout we see that characters define themselves by their own choices, who make emotionally difficult decisions that can cost them everything, who confront themselves and challenge themselves to become more than they have been. Hurwitz spins a great story, but more delightfully he draws great characters. Orphan X books will stay on my reading list because of those characters, and I cannot wait to find out what Evan Smoak faces in the next novel of the series.